Below is a set of good iPad apps that you can use with your kids and students to enhance their mathematical thinking. 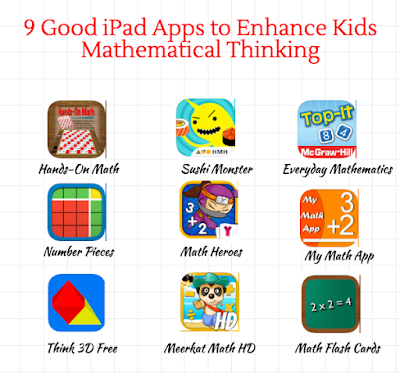 These apps are meant for young learners and are specifically useful when introducing kids to those rudimentary notions of mathematical computations. The purpose of teaching kids to think mathematically, as detailed in Kaye Stacey's paper, is three folds: First, it will allow kids to conduct mathematical investigations by themselves. Second, it will help them acquire other thinking skills particularly problem-solving and as mathematician Paul Halmos (1980) stated, 'problem solving is the heart of mathematics'. Third, it helps kids get a deeper appreciation of mathematics and use it in their daily and working lives. Hands-On Math: Interactive Hundreds Chart creates a virtual math playground where students explore, investigate and discover mathematical concepts. Students use colored markers on the Interactive Hundreds Chart to represent patterns and number sequences. Designed for people of all ages, Math Flash Cards Multiplication is an app that allows the user to practice simple basic multiplication facts or extend the users ability to work out complex multiplication problems up to three digit numbers. Users can control the number of digits used to generate the problems. From one digit to three digits can be seclected by the user. Users also can control the number of questions given during one session. Designed and programmed by two former high school teachers, Meerkat Math is more than just a runner game. Every level is packed full of questions that entertain and enlighten. Complete missions by running through eight mini-games on an island packed full of challenges. Play and level up to unlock all 8 modes. Number Pieces Basic helps students develop a deeper understanding of place value while building their computation skills with multi-digit numbers. Students can use the number pieces to represent multi-digit numbers, count, regroup, add, and subtract. The drawing tools allow students to label representations and show their understanding. With Yogome, Inc. learning math is a blast. Math Heroes 1-Basic Operations puts a martial arts twist on elementary-level arithmetic. Unlike straightforward memorization and drilling, Math Heroes 1 engages multiple parts of the brain, improving speed, comprehension, and retention of concepts. If you’re looking for an alternative to traditional teaching methods, Math Heroes is a great way to get ahead of the learning curve.